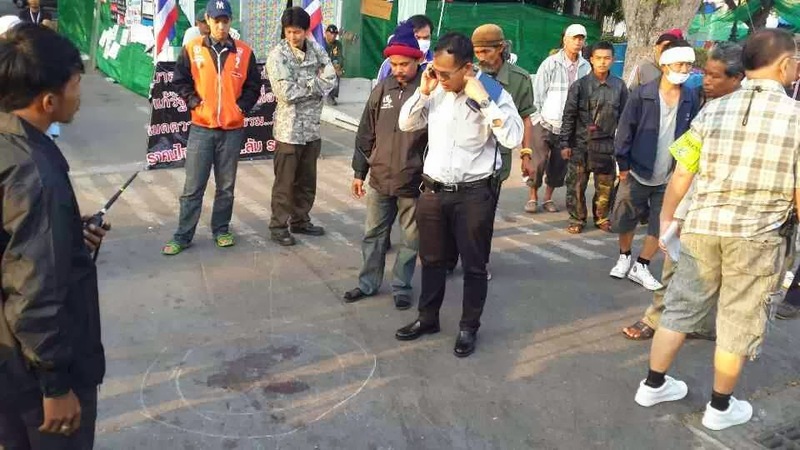 Same violence seen used by Thaksin Shinawatra in 2010, now unfolding again. December 28, 2013 (Tony Cartalucci) - At approximately 3am Saturday morning, regime gunmen drove by the anti-regime rally site near Chamai Maruchet Bridge and gunned down one security guard - leaving several others injured. This comes one week after the regime's "red shirt" supporters began threatening an armed campaign of violence against protesters if the regime's sham elections were disrupted, and just after this week's violence in Din Daeng where one policeman and one protester were killed. In the lead up to, and during major bloodshed in 2010, when Thaksin Shinawatra deployed some 300 heavily armed professional mercenaries (HRW's "Descent into Chaos" PDF page 62) in Bangkok in a failed attempt to violently seize back power, there were several drive-by attacks on his political opponents (BBC, AFP, AFP, ). Open violence has been a hallmark of Thaksin's dark reign over Thai politics since taking office in 2001, and is one of the main reasons protesters seek to oust him and his influence permanently from Thailand's political landscape. In 2003 he conducted a so-called "war on drugs" that saw nearly 3,000 innocent people extrajudicially murdered in the streets. Half of those killed, according to Human Rights Watch, turned out to have nothing at all to do with the drug trade. The following year Thaksin Shinawatra would oversee the brutal crackdown on protesters in the nation's troubled southern provinces that had, prior to his administration, seen a 20 year lasting peace. Protesters would be hogtied and left to suffocate in the back of cargo trucks. 85 would die in a single day. Thaksin's brutal approach to addressing unrest in the south was cited for the gradual increase of violence and loss of life (NYT). Also, throughout his first term in office, According to Amnesty International, 18 human rights defenders were either assassinated or disappeared. The most troubling aspect of Thaksin Shinwatra and his supporters' brutality and tendency toward violence is that is seen as wildly popular by his electorate who continuously return him to power despite his overt criminality, absolute illegitimacy, and dangerous abandonment of basic human rights. Violence is expected to continue to plague the current political conflict as the regime comes closer and closer to finally collapsing.